TORONTO – Millennials under age 25 are a sought after and difficult to reach demographic for marketers. 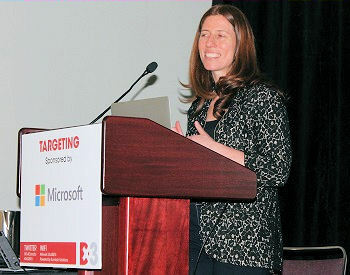 Attendees at the Dx3 digital marketing conference got some tips Thursday on how to reach these elusive young consumers. In her presentation How to Market to Millennials in the Digital Age, Candice Faktor shared her experience around marketing to millennials under the age of 25 at Wattpad, a Toronto-based company with an online community for writers and readers that skews heavily to the younger end of the millennial spectrum. Millennials go up to age 35, but Faktor said she’s separating out the age 25 and younger because that group is so different from the first half of the millennial generation. They’re the pure digital natives. At the same time, Faktor said entrepreneurship is in the DNA of the millennial. They believe they will create their own future because they have the tools to create music, stories, apps, whatever they want. It also changes how they think about entertainment – it’s been described as the maker movement. Wattpad has 40 million visitors from around the world every month with 100,000 joining every day; 80 per cent are under age 25. They read serial stories from amateur authors, and comment and interact with the writers. Fan fiction involving boy band members is a popular genre. Wattpad is the hub, but stories are also shared and talked about on Instragram and other social networks. And anonymity is the norm. Stories aren’t just read; people write their own, so the barrier between consumption and creation fades away. And Faktor said Wattpad also lends itself to overcoming the lack of attention span issue with younger millennials. “You can’t take it in a bite size. It’s an immersive experience when you’re hooked on a narrative. It’s extremely hard not to read the next chapter,” said Faktor. Wattpad has tried a number of ways to link its highly desirable millennial user base with marketers that want to reach them, and has learned some lessons along the way. So has fitting existing stories to brands, with ads for Taylor Swift’s new album performing well inside pieces of fan fiction featuring Taylor Swift. Brands have also written their own stories for Wattpad readers, with writers of the new USA Network TV series Dig writing stories for the platform. Brands have also created a whole campaign around a Wattpad story. The company has a very large following in the Philippines, and Unilever wanted to reach it to promote its Eskinol pimple cream. They commissioned a Wattpad writer to write a story about someone getting a pimple just before a date. Based on reader feedback, they then shot webisodes based on the characters from the story, followed by personal appearances with the actors. Now a TV series is being created. Stories are the currencies that can create emotion and a connection. Use stories in whatever you’re doing to drive that emotional attachment. It’s not about advertising. It’s about creating entertainment. If it’s entertaining our audience is happy and if it’s not, they’re really vocal about it. When we failed, it obviously looked and felt like an ad. If you aren’t authentic and fully transparent as to what the relationship is between you and the brand, they’ll smell it and you won’t succeed. When you’re honest with the community they’re really OK with it. Enable creators. Let them actually help you connect with the audience with immersive entertainment.